Jamie Muscato replaces Bart Edwards as Nathan in The House of Mirrors and Hearts , who has had to withdraw from the production due to unforeseen circumstances. Muscato recently starred in Dogfight at the Southwark Playhouse. His other theatre credits include: The Light Princess at the National Theatre and Rock of Ages, Love Story and Spring Awakening in the West End. He also appeared in both the film and the 25th Anniversary tour of Les Misérables. The House of Mirrors and Hearts is a new musical by Eamonn O’Dwyer and Rob Gilbert which will preview at the Arcola Theatre from 2nd-5th July (runs until 31st July). Starring Graham Bickley (David), Gillian Kirkpatrick (Anna), Grace Rowe (Laura), Molly McGuire (Lily) and Bart Edwards as Nathan, it is directed Ryan McBryde, with Musical Direction by David Randall and Set And Costume Design by David Woodhead. 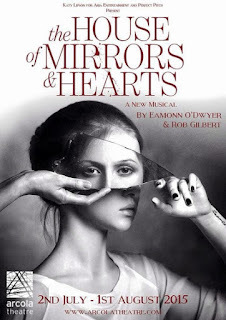 The House of Mirrors and Hearts is a contemporary British story about a dysfunctional family haunted by their past. Keeping secrets is a kind of art…When Anna’s husband is killed in a tragic accident at their home, her family’s life is changed forever. Seven years pass and, torn apart by grief, Anna has drunk herself numb.Her daughters, Lily and Laura, exist in a world of secrets and lies. They spend their days in bitter silence and suspicion, until Nathan, a new lodger studying theworks of a forgotten poet, forces them to confront their past. Tensions within the family build, threatening to shatter this already broken household once and for all.